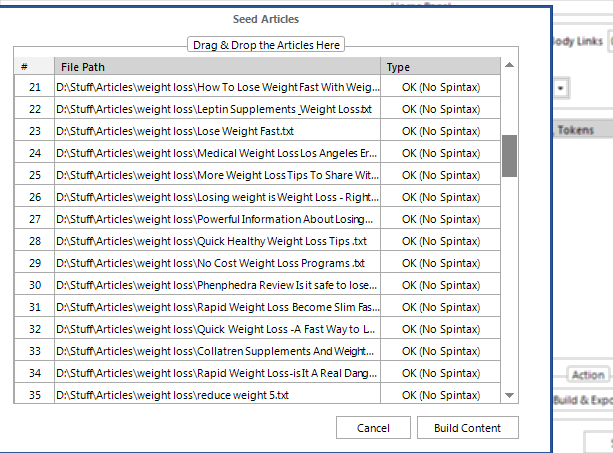 In this tutorial, you will learn how you can use already scraped articles, or PLR articles saved on your hard drive to build your KontentMachine campaign. Important: You can use files in nested, flat or no spintax at all. KontentMachine WILL NOT apply any paragraph or sentence spinning thus keeping their structure. 4. Choose the word/phrase level spinner you would like to use. 5. 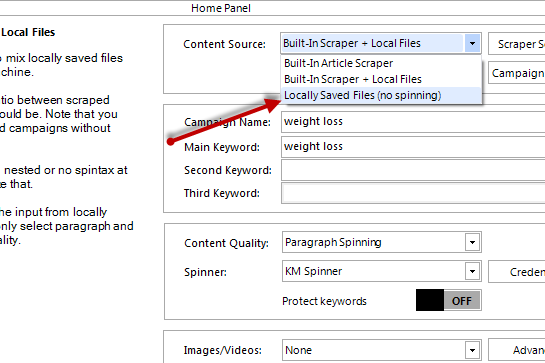 Select whether you would like to protect certain keywords from spinning. 6. Choose if you would like images and/or videos in your articles. 8. Select what type and how many of links you would like and set them up. 10. Just drag & drop the files you would like to use in the next window. KontentMachine will recognize what spintax they are in if any. Kontent Machine will take all the files in that window and modify them according to your preferences. It will also select the correct tags and categories. If you have enabled images/videos, it will also search for and insert them into your content.